I always thought that the numbers on the left side of the shields menu indicate how many ads/cookies/scripts have been blocked on that site. I recently found out though that this often doesn’t match the number of blocked scripts that are listed when clicking the respective menu. 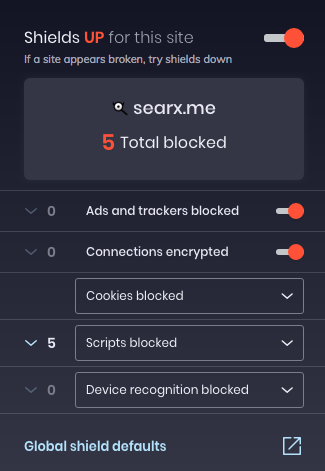 Go to searx.me with shields blocking ads, cookies, scripts and device recognition. It displays “5” on the left side next to “Scripts blocked”. 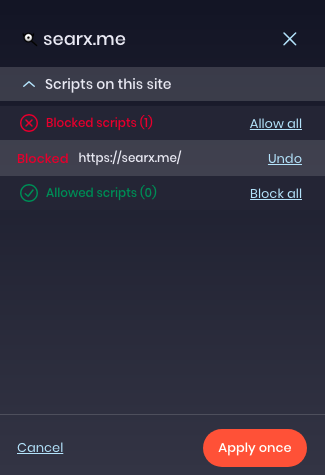 Click on the arrow-down and see only “Blocked scripts (1)” with searx.me listed, no other scripts. Allowed scripts is obviously at (0) as that is the shields setting we chose. I thought this number indicates the number of scripts blocked but if we click on it, the listed blocked scripts are often times less than what is being displayed. Is that number meant to indicate something else or is this a bug? While we’re at it: could you guys make it so we can permanently enable only selective scripts on a site? I used to love this back in the FF+NoScript days. Makes it possible to leave out lots of google scripts without breaking the site. On current brave, we can apply selective settings only once. +1 from me for this important feature. I used to love this on NoScript for Firefox - you can cut out lots of Google scripts from all kinds of different websites and regardless of Google, it increases safety to just enable the scripts that are really needed for site functionality.